Directions are for size Small; changes for sizes Medium, Large and Extra Large are in parentheses. Red Heart® Super Saver®: 5 Ounces No. 718 Shocking Pink CA, 6 ounces No. 784 Bon Bon Print CB, 2 ½, ounces each No.311 White CC and No. 512 Turqua CD. GAUGE: 16 sts = 4"; 16 rows = 4" in pat. To Change Color at end of row: Draw up a loop in last sc, drop color in use; with next color to be used, yarn over and draw through 2 loops. 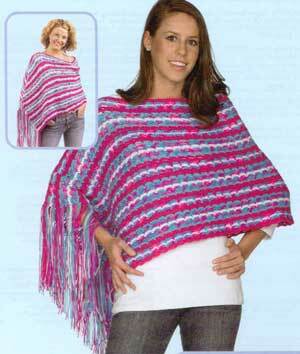 Note: Begin and end each color leaving a 12" end that you will incorporate into the fringe when finishing poncho. PATTERN ROW: Ch 1, sc in first sc, * ch 3, skip next sp, sc in next sc; rep from * across; turn. Rep this row for Pattern Row. STRIPE PATTERN: 1 row CB, 1 row CC, 1 row CB, 2 rows CA, 1 row CD, 2 rows CB, 1 row CC, 2 rows CB, 1 row CD, 2 rows CA. Rep these 14 rows for Stripe Pattern. With CA, ch 226 (234, 242, 250). Row 1 (Right Side): Sc in 2nd ch from hook, * ch 3, skip next 3 ch, sc in next ch; rep from * across changing to CB in last sc; turn. Work Pattern Row and Stripe Pattern until approximately 18 (18, 20, 20)" from beginning. Piece should measure approximately 56 (58, 60, 62)" wide. FINISHING: Fold piece in half with right sides together. Mark each side 13 (14, 14, 15)" from fold. Sew from marker to end, leaving center 26 (28, 28, 30)" open for neck. Fringe: Cut 24" lengths of each color. Knot one strand of fringe in each row end, matching fringe and row color, as follows: fold one strand in half forming a loop; insert hook from the wrong side of the fabric into the row end and into the loop; draw the loop through the fabric for approximately 2", then draw the yarn ends (including those left when beginning or ending a color) through the loops and tighten. Trim ends. Directions are for size Small; changes for sizes Medium, Large and Extra-Large are in parentheses. RED HEART® "Super Saver®": 5 Ounces No. 718 Shocking Pink CA, 7 ounces No. 784 Bon Bon Print CB, 1 ½, ounces No. 311 White CC, 2 ½, ounces No. 512 Turqua CD. Circular Knitting Needles: 6.5mm [US 10.5] - 29". Yarn needle; 3 stitch markers. GAUGE: 13 sts = 4"; 24 rows = 4" in Garter stitch (Knit every row). * 2 Rows CA, 2 rows CB, 2 rows CC, 2 rows CB, 4 rows CA, 2 rows CD, 4 rows CB, 2 rows CC, 4 rows CB, 2 rows CD, 2 rows CA; rep from * for 28-row Stripe Pattern until approximately 18 (18, 20, 20)" from beginning. Bind off loosely. Piece should measure approximately 56 (57 ¾, 60 ¼, 62)" wide. FINISHING: Fold piece in half with right sides together. Mark each side 13 (14, 14, 15)" from fold. Sew bind-off edges together from short sides to markers, leaving center 26 (28, 28, 30)" open for neck. Fringe: Cut 24" lengths of each color. Knot one strand of fringe in each row end ridge, matching fringe and row color, as follows: fold one strand in half forming a loop; insert hook from the wrong side of the fabric into the row end and into the loop; draw the loop through the fabric for approximately 2", then draw the yarn ends through the loop and tighten. Trim ends. RED HEART® "Super Saver®", Art. E300 (7 ounce/ 364 yard solid color; 5 ounce/278 multi-color skein). ABBREVIATIONS: CA, CB, CC, CD = Color A, B, C, D; ch = chain; mm = millimeters; rep = repeat; sc = single crochet; st(s) = stitch(es), * = repeat whatever follows the * as indicated.